The city of Toronto has the fastest growing economy in Canada, CIBC says in a review of 25 major cities across the country. The condo boom and rebound in auto exports to the U.S. helped push Toronto ahead of Calgary, Vancouver and the other western Canadian hotspots that dominated the top 10, the report published by the bank on Thursday found. “What’s impressive about Toronto is that it’s been up there for a long time, not just for the past year or two. It’s been in the top five for the past seven years,” said the report’s author Benjamin Tal, deputy chief economist at CIBC. “It’s much more difficult to accelerate when you’re already running fast,” he added. However, Toronto may be headed for a fall in 2013, Tal warned in an interview. “Is it reasonable to assume the condominium market will not be in fire? Yes it is. Is it reasonable to assume demand for autos in the U.S. will slow down? Yes it is. So it’s possible Toronto might lose its top spot in 2013,” he said. The public sector — a major local employer — is also expected to shrink as governments cut spending, he added. The rankings are based on the average of nine weighted variables, including population growth, employment growth, housing starts and bankruptcy rates. The data was selected in part because it’s readily available, Tal said. Used to create the Canadian Metropolitan Activity Index, it’s meant to be a proxy for gross domestic product, or GDP, the widely accepted measure of national economic growth rates. 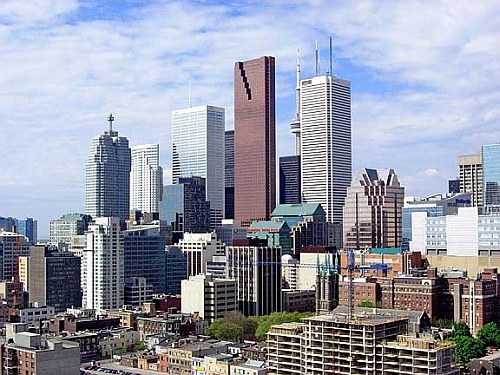 Toronto was outscored on the individual rankings by other cities. Saskatoon led for population growth, housing resales and non-residential building permits, for example. Saguenay led for employment growth. Edmonton had the lowest unemployment; St. John’s had the highest share of full-time employment growth and lowest business bankruptcy rates. However, Toronto’s score in each category was high enough to propel it in the top spot overall with an index rating of 20.6 points, Tal said. “Simply put, the multi-channel nature of Toronto’s economic engine is the secret not only behind its current top position, but also behind its ability to maintain a relatively high grading over the past two years,” Tal said in his report. “This can be easily seen in the robust activity of the city’s economy during the economic recovery, with the city outpacing the national average by a wide margin,” he wrote.